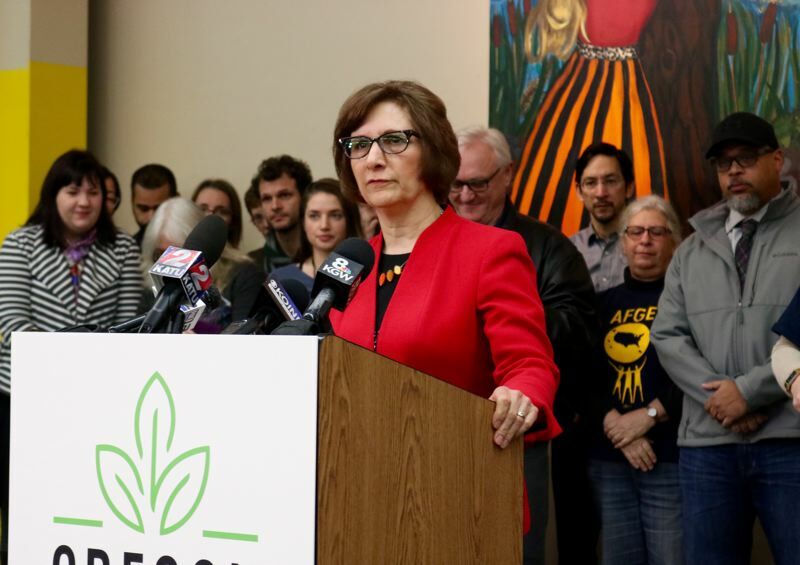 Reps. Suzanne Bonamici, Earl Blumenauer and Sen. Ron Wyden blast president at Oregon Food Bank. Members of Oregon's delegation to the U.S. Capitol have parked the blame for the partial government shutdown at the feet of one man: President Donald Trump. "This is absolutely not the fault of the Democrats," Rep. Suzanne Bonamici said of the federal closure. "It's infuriating, it's unacceptable and it must end." 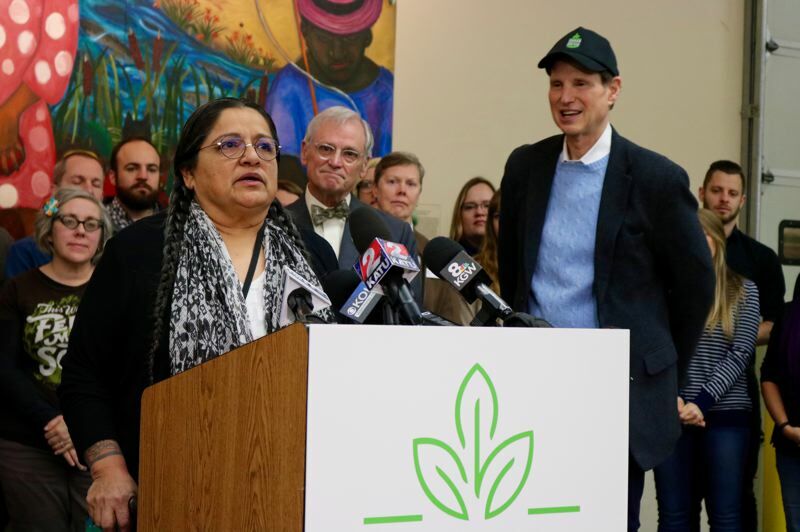 Bonamici was joined by like-minded colleagues Sen. Ron Wyden and Congressman Earl Blumenauer at the distribution bay of the Oregon Food Bank, 7900 N.E. 33rd Dr., on Friday, Jan. 18 — the 27th day since parts of the federal government ran out of funds in late December. "This shutdown isn't making America great," quipped Wyden, "it's making America wait for Donald Trump to finally come to his senses and reopen the government." As the longest-ever funding gap in this nation's history approached its fifth week, Oregon lawmakers rallied to support federal workers, some of who need help finding food or paying rent because they are furloughed or working without pay. Bonamici said some 500 members of the U.S. Coast Guard have been ordered to patrol Oregon's north coast without pay. She said her office has spoken with a Transportation Security Administration agent who was forced to sell plasma, a law enforcement officer who can't pay rent and a prison counselor in Yamhill County staring down student loan debt. And while the politicos branded the fray a "Trump Shutdown," Bonamici and Blumenauer noted that the Democratic-majority U.S. House of Representatives has passed many bills that would reopen the government — but Republican Majority Leader Mitch McConnell will not allow the Senate to vote on the proposals. "This guy doesn't just move the goalposts, they're out of the stadium," Blumenauer said, referring to McConnell. Democratic party leaders say they are willing to compromise by increasing the money flowing toward some border security measures, such as fortified fencing, drones, surveillance or hiring more guards. But they've stonewalled Trump's demand to build more walls along America's southern border with Mexico. "We don't want drugs or smugglers coming into our country," Bonamici noted. State Rep. Tawna Sanchez, who represents north-central Portland, said Trump is similar to the "abusers who only think about themselves" that she encounters in her work with survivors of domestic violence. Representatives from the Oregon Food Bank and SnowCap Community Charities say their network of donated supplies is available to anyone who is hungry, including federal workers. After leaving the press conference, the lawmakers visited Portland International Airport in order to demonstrate with locals unions and distribute food boxes provided by the Sunshine Division. CLARIFICATION: This article has been updated to clarify who supplied the food boxes distributed by lawmakers.